Grassland biomes are large, rolling terrains of grasses, flowers and herbs. Latitude, soil and local climates for the most part determine what kinds of plants grow in a particular grassland. A grassland is a region where the average annual precipitation is great enough to support grasses, and in some areas a few trees. The precipitation is so eratic that drought and fire prevent large forests from growing. Grasses can survive fires because they grow from the bottom instead of the top. Their stems can grow again after being burned off. The soil of most grasslands is also too thin and dry for trees to survive. When the settlers of the United States moved westward, they found that the grasslands, or prairies as they called them, were more than just dry, flat areas. The prairies contained more than 80 species of animals and 300 species of birds, and hundreds of species of plants. There are two different types of grasslands; tall-grass, which are humid and very wet, and short-grass, which are dry, with hotter summers and colder winters than the tall-grass prairie. The settlers found both on their journey west. When they crossed the Mississippi River they came into some very tall grass, some as high as 11 feet. Here it rained quite often and it was very humid. As they traveled further west and approached the Rocky Mountains, the grass became shorter. There was less rain in the summer and the winters got colder. These were the short-grass prairies. Grassland biomes can be found in the middle latitudes, in the interiors of continents. They can have either moist continental climates or dry subtropical climates. In Argentina, South America, the grasslands are known as pampas. The climate there is humid and moist. Grasslands in the southern hemisphere tend to get more precipitation than those in the northern hemisphere, and the grass tends to be the tall-grass variety. There is a large area of grassland that stretch from the Ukraine of Russia all the way to Siberia. This is a very cold and dry climate because there is no nearby ocean to get moisture from. Winds from the arctic aren't blocked by any mountains either. These are known as the Russian and Asian steppes. In the winter, grassland temperatures can be as low as -40° F, and in the summer it can be as high 70° F. There are two real seasons: a growing season and a dormant season. The growing season is when there is no frost and plants can grow (which lasts from 100 to 175 days). During the dormant (not growing) season nothing can grow because its too cold. In tropical and subtropical grasslands the length of the growing season is determined by how long the rainy season lasts. But in the temperate grasslands the length of the growing season is determined by temperature. Plants usually start growing when the daily temperature reached about 50° F.
In temperate grasslands the average rainfall per year ranges from 10-30 inches. In tropical and sub-tropical grasslands the average rainfall per year ranges from 25-60 inches per year The amount of rainfall is very important in determining which areas are grasslands because it's hard for trees to compete with grasses in places where the uppers layers of soil are moist during part of the year but where deeper layer of soil are always dry. The most common types of plant life on the North American prairie are Buffalo Grass, Sunflower, Crazy Weed, Asters, Blazing Stars, Coneflowers, Goldenrods, Clover, and Wild Indigos. Some common animals in the grasslands are Coyotes, Eagles, Bobcats, the Gray Wolf, Wild Turkey, Fly Catcher, Canadian Geese, Crickets, Dung Beetle, Bison, and Prairie Chicken. 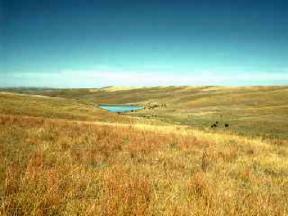 "Temperate Grasslands" http://www.runet.edu/~swoodwar/CLASSES/GEOG235/biomes/tempgrass/tempgras.html, (Oct. 2000).